Hard to believe it’s been 7 10 years. I am reposting this blog post that I did back on 9/11/2008, adding my thoughts and what I did on that fateful day ten years ago. A very somber day for me that Tuesday. My day started off like most days. I had just started dating my now wife a couple of months before. We were in preparations for me to move into her home. At the time we had a TV in our room and we used the alarm clock to wake up. I remember the DJ mentioning something about a plane crashing into the World Trade Center. This was about 6:55am. I turned on the TV to see Katie Couric on the Today Show and images of the WTC and smoke billowing out of it. I was awake. I spent the next two hours watching the news unfold as it happened live, while getting ready for work. I called my mom and we talked about how horrible it was. I called my friend Jim and we talked about 13 months previous being in NYC and how grateful I was to him for experiencing the WTC. My wife and I talked about what had happened and we watched in unbelief as the news showed live the first WTC tower falling into a pillar of dust and rubble. I got on the TRAX train about 10am and headed to work. I worked in downtown SLC and the train ride was very somber. I wasn’t concerned about any threat, but obviously some may have, given how empty the trains were. Arriving at work, the TVs were on and most of the day, people watched the events. 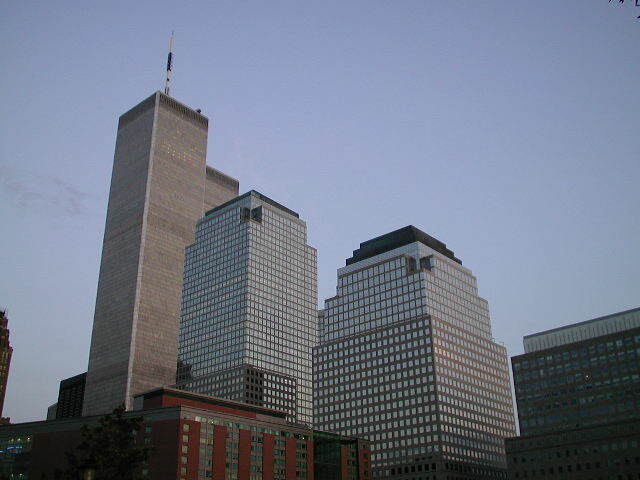 The day seemed to be about nothing but the WTC attacks. Arriving back home later that night, it was just mind-numbing what had happened that day in New York City. I will never forget that day and what I had witnessed on the news. Part of my memory goes back to August 2000. A good friend of mine was living and working in Lower Manhattan at the time. My current girlfriend at the time had just broken up with me. Our plan was to go to NYC for her birthday. Obviously, she didn’t go. I had contemplated not going at all, but my friend called me multiple times and told me that I needed to still make the trip. So I did. And thanks to his encouragement and hosting me at his apartment, I now have a trip that I will never regret. 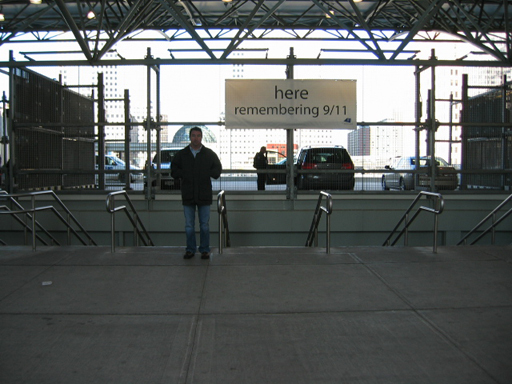 A few photos to remind me how very happy I was to have experienced the World Trade Center. 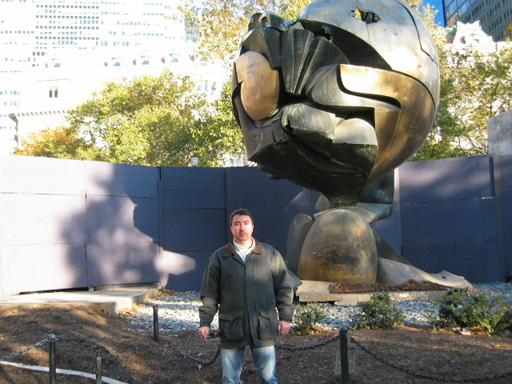 That’s me in front of the WTC Globe, with the North Tower behind it. My wife and I visited New York during the first week of November in 2006. She had never been there before. Of course, one of our stops was the WTC site to see the progress and the memorial. I can tell you my visit was very full of memories, walking around the site and remembering what was once there. We also visited Battery Park, where the remains of the Globe resides. 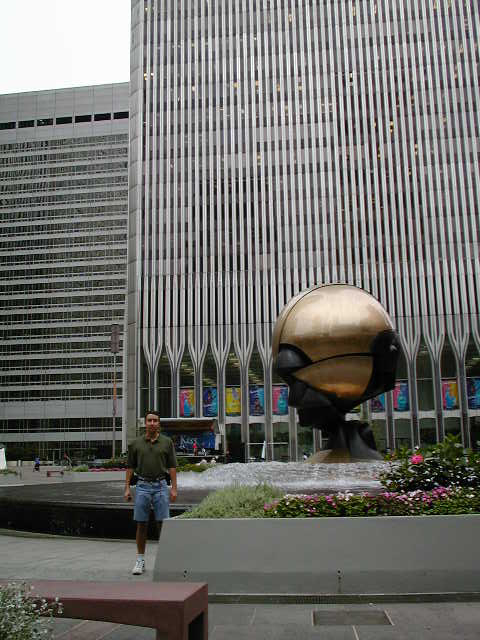 As you can see, I had my picture taken in front of it, similar to the one taken in 2000, minus the towers. My intention of this post was to pay respect to a great city that 7 10 years ago today, survived one of the worst experiences any city could go through. My thoughts are with anyone who lost a loved one, a close friend, a co-worker or someone they knew. My hope is that the spirit of what the WTC was will live inside the future WTC, when all of the rebuilding is completed. And at that time, I plan to visit and once again relive those memories. 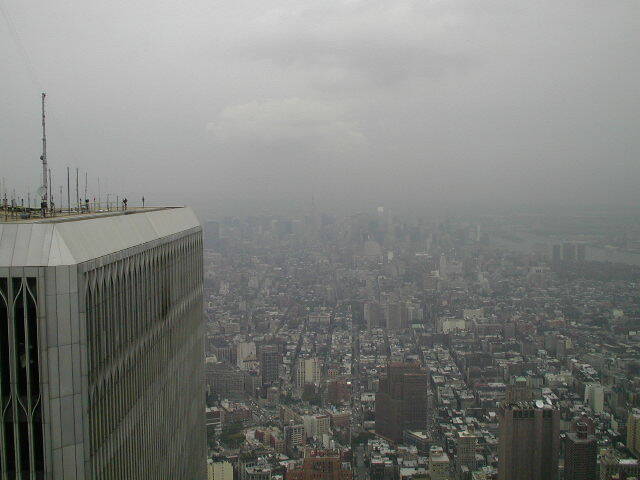 Everywhere I go where people are sharing their photos from the “Top of the World,” there’s that same photo looking north with part of WTC1 in the shot (like your second photo). It’s amazing to think of the tens of thousands of images of that same view. And very sad to realize there will never be any more. Yes, I’ve seen so many of those same shots myself. And yes, sad to realize there will be no more. Great post. My one and only visit to New York was in 2008. While there I did visit the WTC site and remember it being a very sombre place and was really quite moving. It is a somber place now. And I imagine the reflecting pools that are there now are even more somber.